The study aimed at measuring the external radiation doses to workers from patients who were administered radiopharmaceuticals in the nuclear medicine department. The purpose of this study was to evaluate the radiation safety procedures in the department of nuclear medicine. A total of 80 patients were randomly selected for the study. These patients were injected with either 99mTc-pertechnetate or 99mTc-MDP (methylene diphosphonate). The dose rate was measured in hot lab, waiting room and in the scanning room at distances of 10, 50 and 100 cm from the patient at different time intervals by using a radiation survey meter. The absorbed dose from radioactive patient to radiation workers was calculated by using RADAR software and mathematical formulae from the measured dose rate. The mean dose rate from thyroid scan atients at a distance of 10, 50 and 100 cm, after administration of injection was found to be 41 μSv/h, 31 μSv/h and 22 μSv/h respectively; whereas the dose rate from bone scan patients was calculated at 62 μSv/h, 31 μSv/h and 28 μSv/h. The dose rate was also measured after 15 min and 30 min in waiting and scanning room for the same patients. The mean absorbed dose to nuclear medicine occupational workers calculated both manually and using RADAR software came out to be less than 1mSv/year. The external doses to radiation workers were within permissible level. The results obtained in the present study are comparable to the previous studies conducted world wide. The radiation dose level to occupational workers in our nuclear medicine department does not exceed the recommended dose limits for workers. Radionuclides are used in nuclear medicine for various kinds of diagnostic and treatment Radiopharmaceuticals injected to patients in a specific amount for a particular test. The most commonly used radionuclide in our department are 99mTc and 131I. It is obvious from earlier studies that external ionizing radiation exposure of nuclear medicine workers arises mostly from radioactive patients rather than the preparation and injection of radio pharmaceuticals . Many researchers have measured the dose rates at different distances and time intervals from the injected patients to highlight the exposure to radiation workers [2, 3]. Radiation exposure in nuclear medicine is caused by radioactive sources and patients. Radioactive patients are a source of radiation for workers and attendants of the patient . It is therefore necessary to quantify the radiation exposure from the patients to occupational workers in the nuclear medicine department. The aim of this study was to measure external radiation doses to workers due to patients who have been administered radiopharmaceuticals in the nuclear medicine department. In this study, dose rate was measured from injected patients to quantify the doses to occupational workers in the nuclear medicine department. For this purpose, 80 patients (45 males, 35 females) were randomly selected. The ages of the patients ranged from 20-60 years (mean age 37.5 years). The selected patients were divided into two groups: 1) patients who were injected with 99mTc-pertechnetate (thyroid scan patients) and 2) bone scan patients who were administered 99mTc-methylene disphosphonate (99mTc-MDP). The activity injected to each patient was measured using a radioisotope dose calibrator (Capintec CRC®-55tR) installed the hot lab of the nuclear medicine department. The dose rate was measured by using survey meter at preselected distances and locations. The LAMSE RM1001-RD survey meter was used in the present study. It measures the radiations in energy range of 50keV to 1.3MeV, and dose rates in the range 0.1μSv/h to 2mSv/h. The dose rate was measured in different locations at distances of 10, 50 and 100 cm from the front of the patient. The measurements were taken in three different locations in the nuclear medicine department including the hot lab, the scanning room and the injected patients waiting room. The measurements were taken at 3 different time intervals at 1-minute, 15-minute and 30-minute after injection. The absorbed dose from radioactive patients can be calculated by using Radiation Dose Assessment Resource (RADAR) software . In this study, RADAR software was used for measurement of absorbed doses from the radioactive patients. In this study, the radiation exposure to occupational workers from radioactive patients was quantified by through time and distance at different locations. Occupational exposures was assessed for whole body scan` and thyroid scan which are major procedures in nuclear medicine department. The dose rates were measured from thyroid and bone scan patients. The measured dose rates at distances of 10, 50 and 100 cm from the patient after 1, 15 and 30 minutes of injection are given in Tables 1-3. The measured values in Table 1-3 show that the dose rates for bone scan patients are higher than dose rates from the thyroid scan patients because the average injected activity of 15.76 mCi is higher as compared to that given for thyroid scans at 4.85 mCi. The measured values also showed that the dose rates to staff from radioactive patients depends on distance. 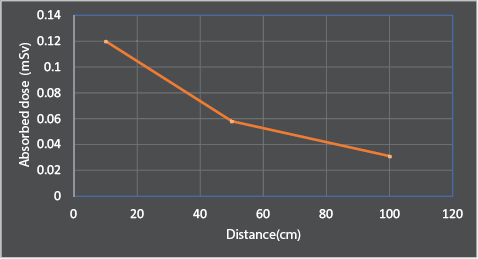 As per the inverse square law, by increasing the distance from the injected patient, the dose rate decreases inversely with the square of the distance: doubling the distance between radioactive patient and the radiation source will reduce radiation exposure by a factor of 4. Unnecessary staff exposure is avoided by maintain a safe distance from the patient. The absorbed dose to nuclear medicine staff was calculated by using RADAR software. The dose received to the nuclear medicine staff after administration of 99mTc-pertechnetate and 99mTc-MDP given in Tables 4-6. The exposure is directly proportional to time spent near the radioactive patients and inversely proportional to the distance from radioactive patients as shown in Figures 2 and 3. Figure 2 shows that increasing the distance from the radioactive patients, correspondingly decreases the absorbed doses. 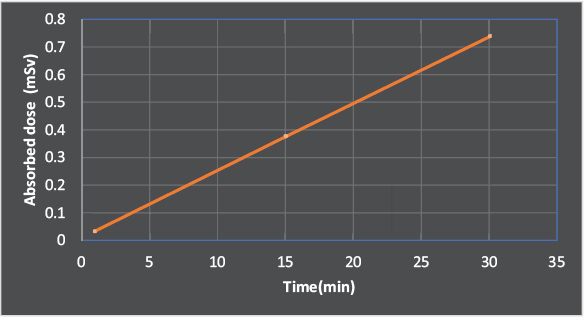 Figure 3 shows that more exposure will result as more time is spent around a radioactive source. The exposure is directly proportional to time spent near the source and activity injected to the patient. All these measurements showed that the measured doses received by workers were well below the dose limit recommended by the ICRP. The calculated dose does not exceed the the recommended dose limits of 1 mSv . The results showed that the radiation dose levels in the nuclear medicine department does not exceed the recommended dose limits to the workers of less than 20 mSv per annum and 1.4 mSv per month. According to ICRP, the maximum allowable dose for one day of nuclear medicine department is 55 μSv . Dose limit for whole-body is 20 mSv per year, prescribed by ICRP and AERB [8, 9] for radiation workers. The measured doses received by workers were well below the dose limits recommended by the ICRP. Radiation safety is of prime importance in nuclear medicine and occupational workers should be monitored regularly. In this study, it was found that external doses to radiation workers were within permissible level. The annual effective doses received by the nuclear medicine staff during whole-body scan and thyroid scan procedures were less than 1mSv/year. It is obvious that exposure to workers does not exceed to the recommended limits set by basic safety standards, published by the International Atomic Energy agency (IAEA). Ethical committee of our institute approved the current study. Smart R. Task-speci?c monitoring of nuclear medicine technologists’ radiation exposure. Radiat Prot Dosimetry 2004; 109:201–9. Chiesa C, De Sanctis V, Crippa F, Schiavini M, Fraigola CE, Bogni A, et al. Radiation dose to technicians per nuclear medicine procedure: comparison between technetium-99m, gallium-67, and iodine-131 radiotracers and fluorine-18 fluorode oxyglucose. Eur J Nucl Med 1997; 24:1380–9. Kurtaran A, Preitfellner J, Kohoutek D, Tousek A, Virgolini I, Havlik E. Radiation exposure in the surroundings of patients after 201Tl myocardial scintigraphy [in German]. Nuklearmedizin 1997; 36:29–31. Helal H. Patient organs dose calculations in nuclear medicine. Int J Recent Res Appl Stud 2012; 11:153–61. ICRP, 2007. The 2007 Recommendations of the International Commission on Radiological Protection. ICRP Publication 103. Ann. ICRP 37 (2–4). ICRP, 2008. Radiation Dose to Patients from Radiopharmaceuticals - Addendum 3 to ICRP Publication 53. ICRP Publication 106. Ann. ICRP 38 (1–2).